1 Montagne Jeunesse Goji Berry Body Smoothie – I really liked this moisturiser. However, I wouldn’t buy it again because I’ll always prefer Montagne Jeunesse’s Buriti Fruit Body Smoothie (same formula, cooler fragrance). 2 Pâtisserie De Bain Crème Pâtissière Body Souffle – a nice enough moisturiser. Not special. I wouldn’t buy it again. 3 Pâtisserie De Bain Crème Pâtissière Shower Gel – this shower gel was alright, but it’s another product I wouldn’t repurchase. 4 L’Oréal Elvive Triple Resist Reinforcing Conditioner – this is one of my favourite conditioners. I’ll buy it (+ the matching shampoo) again. 5 Sukin Moisture Restoring Night Cream – I think this night cream is very good. I’ll buy it again, no doubt! 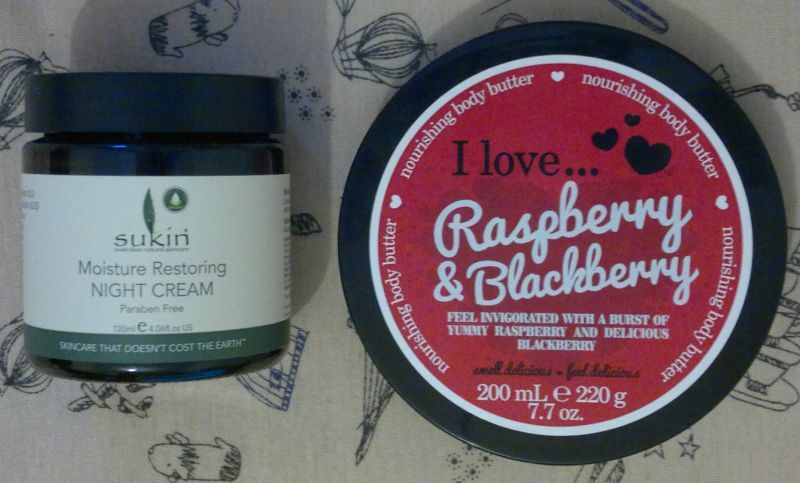 6 I Love… Raspberry & Blackberry Nourishing Body Butter – we (my husband and I) used this one as a foot butter because this one’s been in my stash for far too long. I have one more super old tub of this body butter which we’ll have to use as a foot butter as well. 7 L’Oréal Skin Perfection Soothing Gel-Cream Wash – this is a great face wash! I believe it’s been discontinued (I haven’t seen it in a little while) which is a shame because I would have liked to repurchase it. 8 Boots Botanics Radiant Youth Microdermabrasion Polish – another awesome Boots Botanics product! I would definitely buy it again. Saying this, I have a few comparable products to go through first. 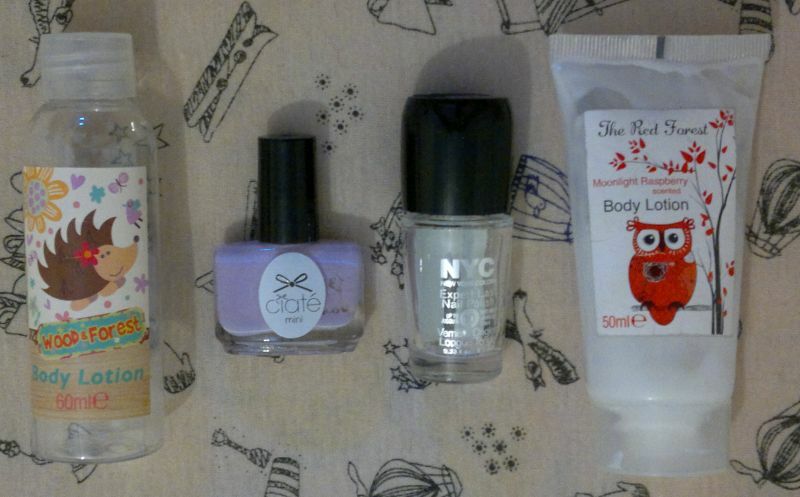 10 NYC In A Minute 202 Grand Central Station – this is one of my favourite clear polishes. I have a few back-ups (I’ve already been using one of my half-empty back-ups for a few weeks now, and I’m confident that this one will be featured in my December empties), but I’ll continue to buy this polish for as long as I can find it. 12 Boots Botanics Skin Brightening Toner – this product was discontinued years ago and this was the last bottle I had. This toner was packed with AHA, BHA, glycolic acid, lactic acid… it was super effective, yet gentle enough not to cause any issues at all around the eyes. I will miss this toner dearly! 13 Manhattan Pro Care Nail Repair – this base coat was alright. For 99p or £1 I’d pick it up again. 14 Olay Essentials Cleansing Milk – I love this cleansing milk. It’s been repackaged and the formula has been changed, but the ‘new’ version of this product seems to be just as good. I’m happy to continue to buy and use Olay products! 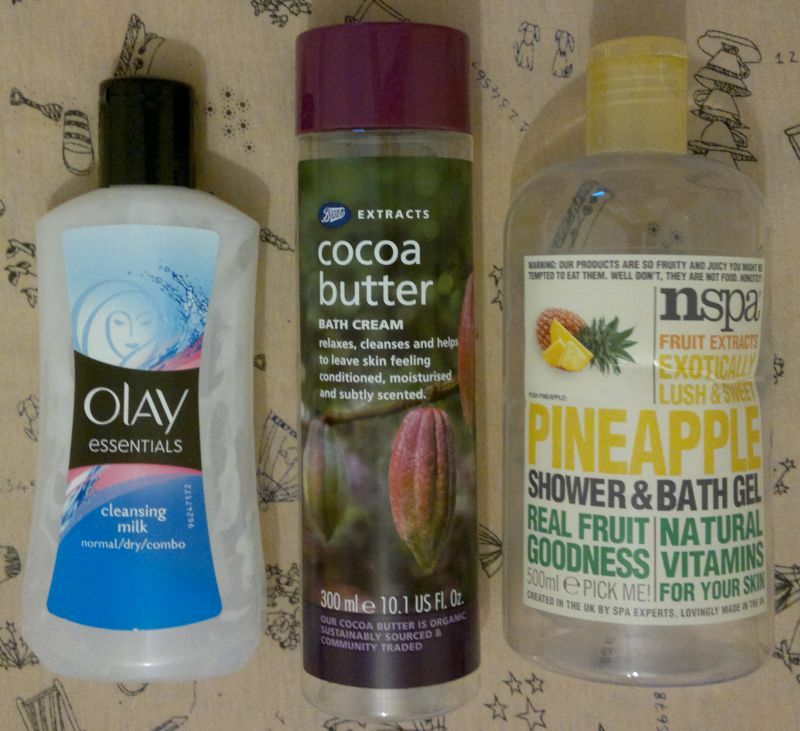 15 Boots Extracts – Cocoa Butter Bath Cream – this is a lovely bath product. It’s been discontinued, otherwise I’d buy it again. 16 NSPA Pineapple Shower & Bath Gel – this is a nice pineapple shower gel. I might buy it again. 1 Wonder Woman Shampoo & Conditioner (100ml travel size) – this is a surprisingly nice shampoo. However, it doesn’t replace a conditioner. I used this shampoo once a week, followed by a deep conditioner (this one or that one). I think I got 8 uses out of this bottle. I have another Wonder Woman shampoo bottle. 2 I Love… Yummy Caramel Body Butter – a great body butter. Smells as yummy as it sounds. I started to use this body butter in April, and I finished it in early June. Unfortunately I cannot repurchase this product because Yummy Caramel was a limited edition. 3 L’Oréal Skin Perfection Serum – this was a nice serum. I started to use it in early April, and I really enjoyed using it. I believe L’Oréal discontinued their entire Skin Perfection collection, so I cannot repurchase this product. 4 Gliss Satin Relax Conditioner – a decent conditioner. I started to use it in May, and I finished it in early June. I got 14+ uses out of this bottle which is actually quite good. I have passed the matching leftover shampoo on to my husband – I am now using a different shampoo and conditioner combo. 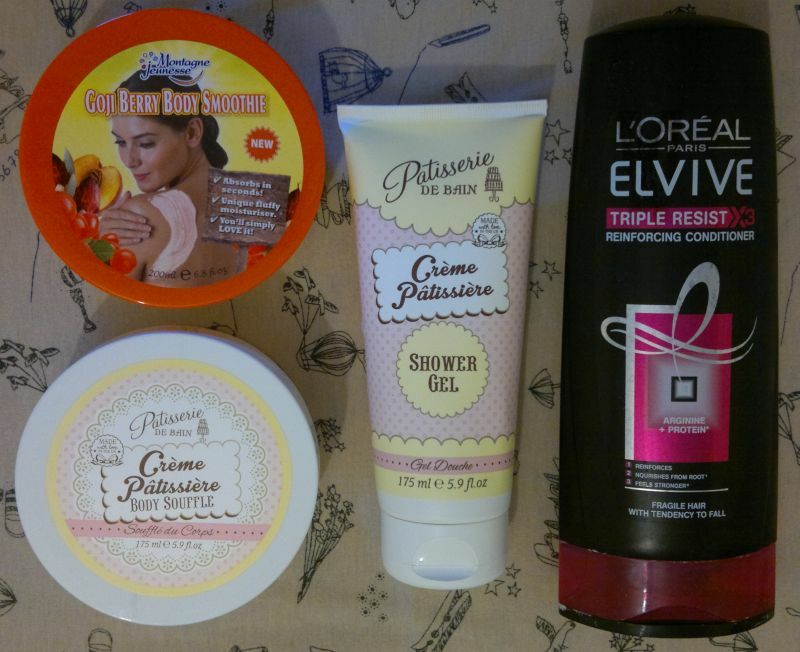 I am fairly certain that I will repurchase Gliss’ Satin Relax products! 5 Sudocrem Skin Healing Cream – this is great skin healing cream. Helps with cuts and grazes, helps with spots and all sorts of skin impurities. It took me over a year to finish this tube. I will repurchase this cream, no doubt! 6 The Red Forest Moonlight Raspberry Shower Gel (60ml travel size) – this was an OK shower gel to use for a few times. Nothing special. Random fragrance. This was from an old bargain-store gift set, so I doubt I’d ever come across it again. In any event, I wouldn’t buy it again. 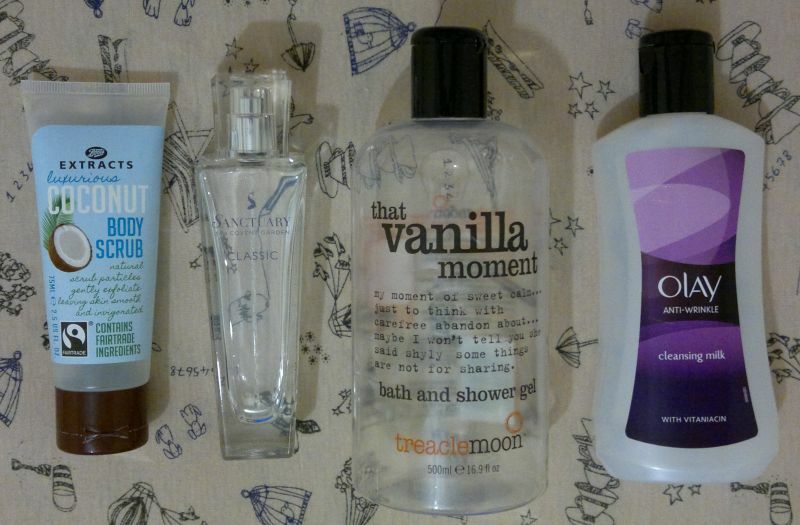 Saying this… I have a few more random products from this line! 7 Boots Botanics Firming Body Gel (40ml travel size) – this product had no effect at all. However, I just got a few uses out of this small tube, so I don’t think I can actually judge the product. This product has been discontinued, but I don’t think I’d have repurchased it anyway. 8 I Love… Yummy Caramel Bath & Shower Crème – I really liked this shower cream, and so did my husband! So this one is a shared empty. I started to use this shower cream in April, and I finished it in early June, just a few days after I’d finished the matching body butter. 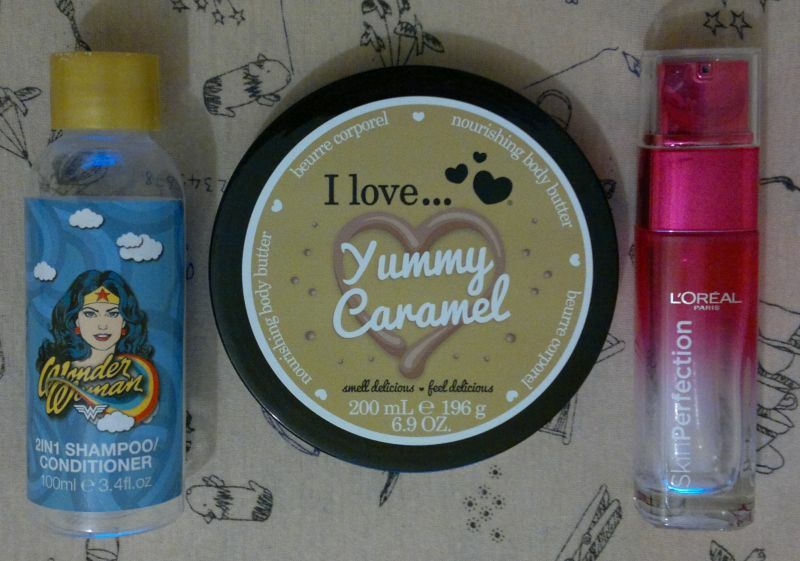 Unfortunately I cannot repurchase this product because Yummy Caramel was a limited edition. 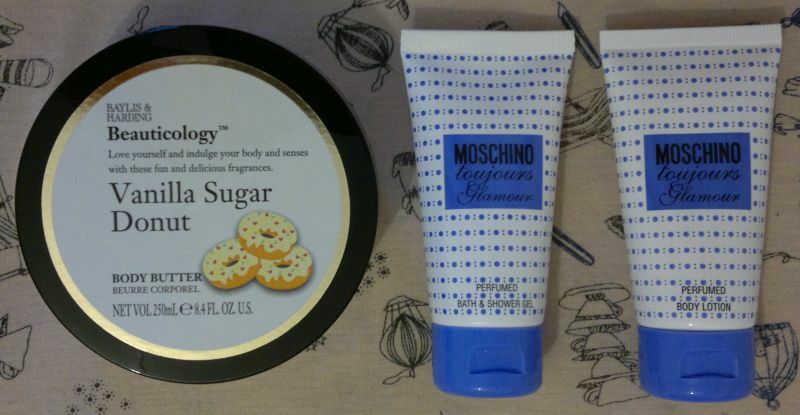 9 Baylis & Harding Vanilla Sugar Donut Body Butter – this is a decent body butter. I started to use it in May, and now it’s finished. I don’t think I’d repurchase it because the fragrance is quite faint. 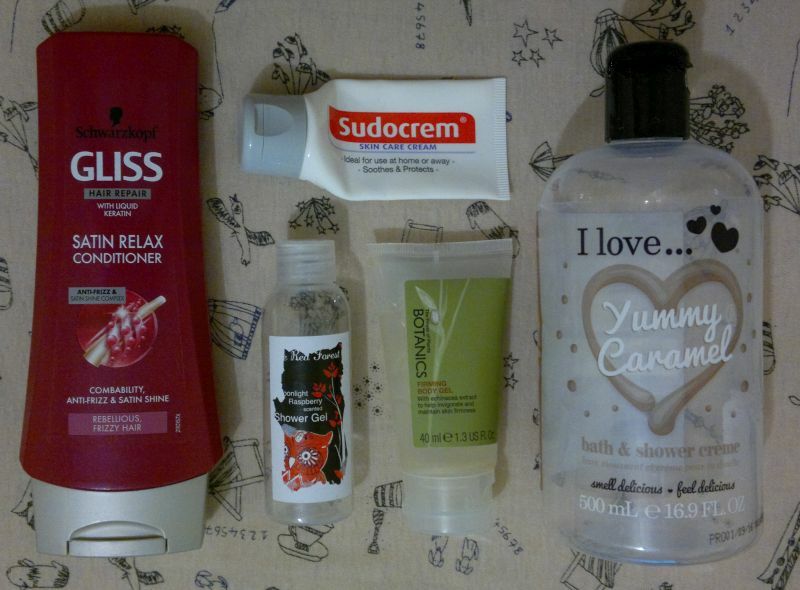 In addition, I prefer Boots’ and Superdrug’s own brand vanilla body butters. 10 Moschino Cheap & Chic Toujours Glamour Bath & Shower Gel (50ml travel size) – I liked this shower gel. However, I don’t love the Toujours Glamour fragrance, so I won’t be repurchasing this shower gel. 11 Moschino Cheap & Chic Toujours Glamour Body Lotion (50ml travel size) – this is a decent body lotion. But I wouldn’t buy it again. 12 Wood & Forest Body Lotion (60ml travel size) – this body lotion was alright. I think it lasted for 5 or 6 days. I wouldn’t repurchase it. 14 NYC Expert Last 138 Classy Glassy – this is a great clear polish. Perfect base + top coat. Dries reasonably quickly, doesn’t shrink colour polish. I have several back-up bottles. 15 The Red Forest Body Lotion (50ml travel size) – this is the exact same product as the Wood & Forest body lotion. This one lasted me for about 5 or 6 days as well. 16 Boots Extracts Luxurious Coconut Body Scrub (75ml travel size) – this is an okayish scrub. I prefer grittier scrubs, so I wouldn’t purchase this one on its own. However, if this scrub is part of the big 2017 Boots Extracts Christmas gift set (which I intend to buy on Boxing Day), I really won’t mind using this scrub again. 18 Treacle Moon That Vanilla Moment Bath And Shower Gel – this shower gel is fantastic. My husband loves it too. And yes, I will repurchase this shower gel, no doubt! Oh, this one is a shared empty. 19 Olay Anti-Wrinkle Cleansing Milk – this is a fantastic cleansing milk. I’ve been using it since November or December last year. I cannot repurchase this product because, unfortunately, it has been discontinued. Hi there! A few weeks ago I emptied the first L’Oréal serum I’ve ever used, and since then I’ve been using another L’Oréal serum – L’Oréal’s Skin Perfection Correcting Concentrated Serum. This serum is aimed at women aged 18-32 who want smoother, brighter and more radiant looking skin. In summary, this serum promises to tighten pores and to make first lines appear smoother – in 7 days! Whilst this serum isn’t perfect, I do like it. Here’s why: I think the pump dispenser is great. Two pumps deliver the perfect amount of serum for my face and neck. Nice! The serum is lightly fragranced – the fragrance is nothing special, but it’s definitely pleasant. I think that this serum feels great on my skin. The lightweight formula delivers a refreshing hydration boost which is very nice! Whilst I don’t think this serum made any difference to my pores at all, I’m still happy with it because it seems to maintain the ‘fresher skin’ look the other L’Oréal serum gave me. I would recommend this serum – and I would recommend you get your 30ml bottle from B&M Bargains. 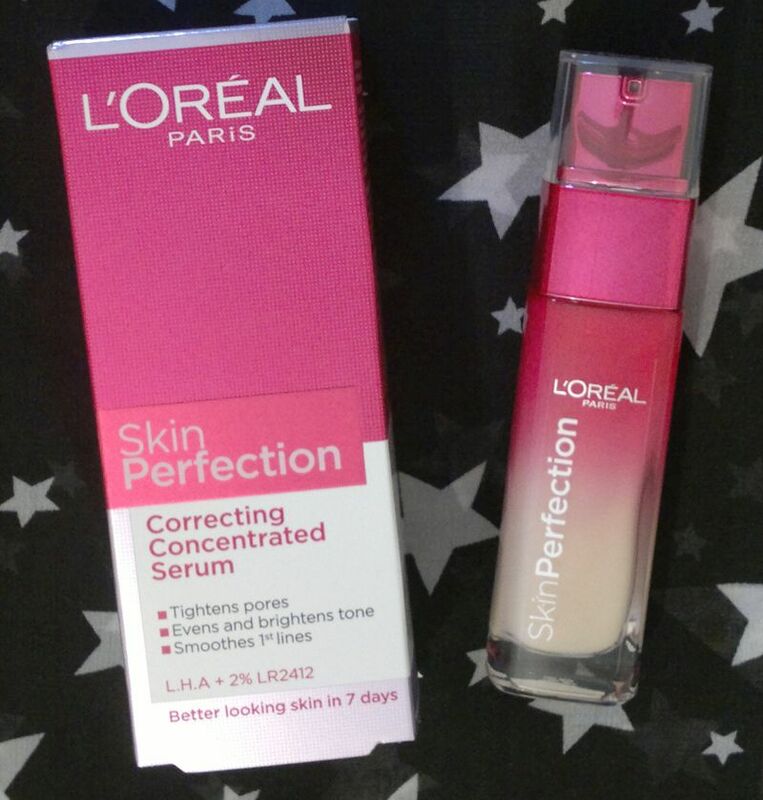 L’Oréal’s Skin Perfection Correcting Concentrated Serum is £15.99 at Superdrug – but it’s only £4.99 at B&M! Hi there! Today’s post is about L’Oréal’s Skin Perfection Velvety-Soft Toner. 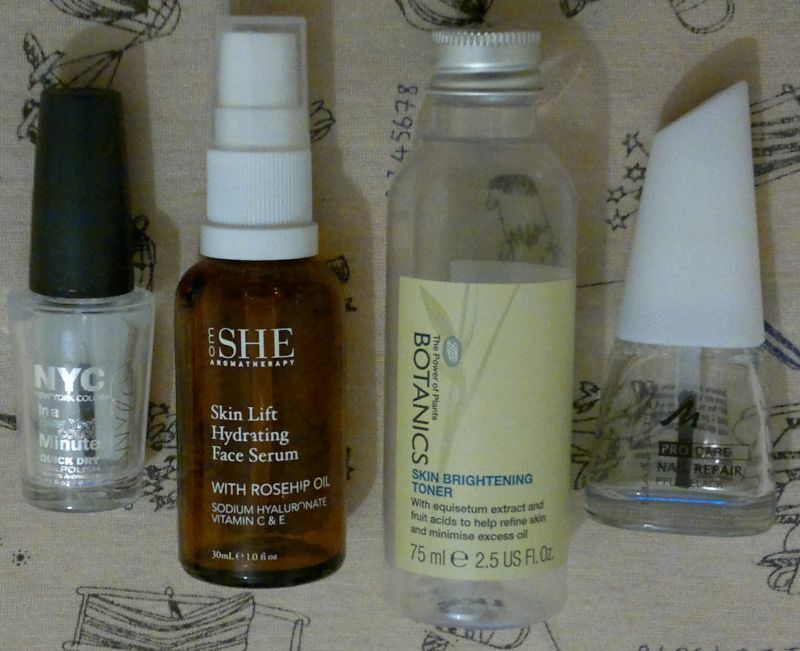 As you can see from the title of this post, I am in love with this toner. Now let me tell you why. So, this toner promises to remove impurities and to reveal toned and silky-smooth skin. In addition, the toner is paraben-free, it’s hypo-allergenic and it’s suitable for sensitive skin. I’ve been using this toner for a few weeks now, and I can say it is definitely suitable for my sensitive (and moody) skin. No redness, no stinging, no burning. This toner feels… like no other! That’s because it really feels velvety on my skin – I love it! I’m also very happy with how well this toner cleanses my face. It removes make-up and cream cleanser residue with ease and it makes my skin feel clean, clear and velvety. It’s amazing! Another bonus is the lovely and subtle fragrance – it’s pure, fresh and ‘pink’. It’s the perfect fragrance to go with the colour and the bottle design. So yeah, I would recommend this toner to everyone. If you’re looking for a new toner, give this one a try! L’Oréal’s Skin Perfection Velvety-Soft Toner is available as 200ml for about £4. However, look out for special offers – I bought mine on a 2 for £5 offer – which is excellent value. 🙂 And since I love the toner so much, I want to try the matching cleanser too. Yes, I’ll continue to use the half-used products in my rota first. But the cleanser will move in with me too – no doubt! If you’ve tried this toner, I’d love to hear to hear what you think. Feel free to leave a comment. And thanks for reading! Hi there! 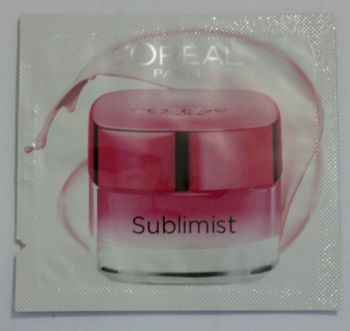 Today’s post is about L’Oréal’s Sublimist Skin Perfection Day Moisturiser. I only had this small sample, but it was enough for me to conclude this is an excellent face cream! Now let me tell you why. When I applied the cream, I noticed the rich texture. The cream felt great on my dry skin. But I wasn’t sure if this rich cream would be a good base for make-up. 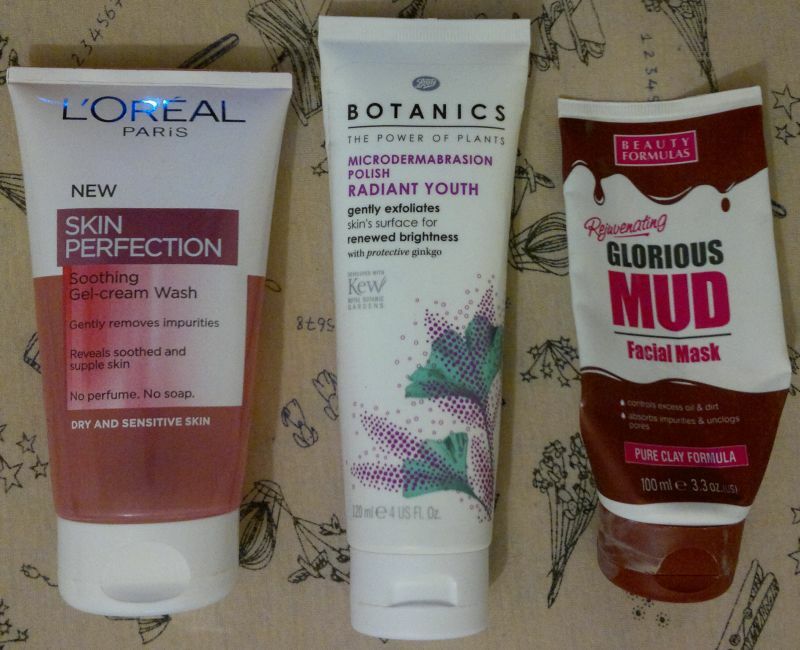 My worries were unfounded because – within a minute – the cream had sunk into my skin nicely. What remained was the feeling of a silky, lightweight moisturiser on my skin. And yes, this cream is a good base for make-up. I found the scent of this face cream to be pleasant as well. It’s not too strong – it’s just right. The only thing I’m not super happy with is that this cream doesn’t contain sunscreen. I do like my facial moisturisers to have SPF 15. So I wouldn’t use this cream on sunny days (because my foundation doesn’t contain sunscreen). However, if you prefer a face cream without SPF, I would definitely recommend this product!